Katniss and Peeta have both escaped the Hunger Games alive, but now it’s time for the Victory Tour around all the districts of Panem. President Snow visits Katniss before the tour, and tells her disturbing news. Her defiance in the games have aroused the districts, and all of Panem now thinks of rebellion and dissent against the Capitol. Katniss’ only chance is to go on the Victory Tour and justify her actions as a mad lover. Katniss knows she’s gambling for her life as she tours the districts and tries to stop the motion of a rebellion that she unwittingly put into place. As far as writing quality, this book continues the excellent writing of the first. We are immersed even further into Katniss’ emotions and fears as the plot moves up to another level. Instead of her troubles ending after the Hunger Games, they only increase. Collins dumps us so deeply into Katniss’ emotions that I almost grew weary of reading the book. In this case, though, this would be a good thing. The book takes things to a darker, more action-packed conclusion, and brings us into a plot which we never could have dreamed of in book one. 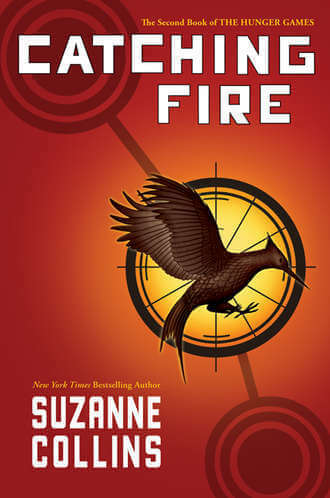 Overall, Catching Fire is an excellent addition to the Hunger Games series that I deeply enjoyed reading. It continues on in the excellent vein that the first book has said and continues the story in a way that definitely grabs your attention. I highly recommend it.